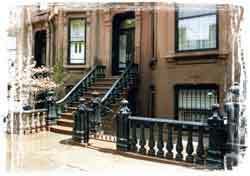 Cobble Hill, Brooklyn, New York, is the setting for this restored cast iron stoop and sidewalk railing. Approximately forty percent of the components are new; the balance was restored. Beware the shop that offers "off season" discounts or anything of the sort. While ornamental ironwork as an industry is somewhat subject to seasonal slowdowns, competent restoration ironworks number about half a dozen nationwide. Accordingly, you as a buyer are much more likely to have to wait until they have shop space available to work on your project. As restoration ironworkers we are forced to turn down nearly as much work as we can accept in order to maintain our high standards of workmanship (and not, incidentally, our excellent reputation). 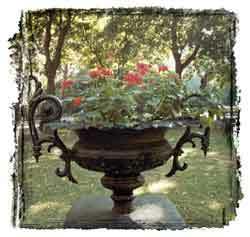 One of two cast iron planters restored for the trustees of Gramercy Park, New York City. These planters, believed to date from the earliest days of the park, are each over four and a half feet in diameter. How long has the company which you are considering been in business under that name? Most of us are familiar with contracting businesses which change names after every few jobs. Unfortunately, the same is true of some firms that claim to be restoration ironworks. We know of one "restoration firm" that has operated under six names (that we are aware of) in the last four years. One firm apparently thinks that imitation is the sincerest form of flattery, and has gone so far as to open an office here in Milford (population 1,143), apparently in the hope that someone will confuse them with us. A further note, a company that has been in some business since (for example) 1962 may have entered the restoration field last week. For the record, the only name that we have had since our inception in 1978 is Architectural Iron Company. The restoration and reproduction of ornamental ironwork has been and is our only business.